According to words from trusted sources, BlackBerry Z10, the BB 10 phone that has been just announced, is expected to go on sale for Rs 39,000 in India starting February 24. This is really good news for BlackBerry fans in India as the phone is coming so early in stores that you won’t have to wait longer as is the case with other high-end phones release date in India. In contrast, BB z10 is likely to be released in March-April in most other parts of the world. BlackBerry devices are already popular among business users and youths in India. With BlackBerry 10 OS and BB Z10 device, the smartphone seems attractive. Another striking change/feature of Z10 is that it no longer requires BlackBerry plan for internet access on the device. User can use normal voice and data plans with BlackBerry Z10 phone. Enterprise or Business users can opt for BlackBerry plans to use special BB services. BB 10 will also support Jelly Bean compatible apps soon. It already supports GingerBread android apps. The real competition here is between BlackBerry and Windows phones as Android is clearly much ahead of the game. So, if BB devices are going to make space for itself, they’re going to take pie from windows phones market primarily. The price of BlackBerry Z10 at Rs 39,000 is not really less, but like every other phones, the price is high at launch and gradually subsides to a more reasonable amount. 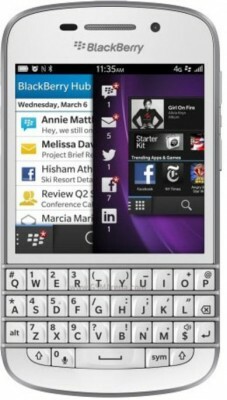 While there is no word on release date of BlackBerry Q10, so let’s wait for official words! We’ve also heard official words on more BB10 devices coming this year, especially cheaper bb10 devices so that bb phones could be affordable to all market segment. About 6 BlackBerrt 10 phones are coming this year. BlackBerry is selling new BB 10 experience and not just plain smartphones, to say in their words! Screen Size of 4.2 inch (10.668 cm). It comes with internal memory of 16 GB. Out of box, it is loaded with BlackBerry 10.